Whilst Storm Katie was not a record-breaker by any means she did provide some evidence of stingjet winds in the wrap-around feature that showed up especially on IR satellite photos and rainfall radar in the later stages of her track across the SE and UK. Here is some analysis from local Reigate Surrey records of these winds to explore this feature more. Stingjets can be the most damaging winds, in this case they were not especially strong. Professionals, like Matt Hugo (NorthWstWx services) and Simon Lee (MMetReading), saw hints of stingjets during the passage of the storm but what evidence of stingjet winds is there “on the ground” and how can amateur observers watch out for these potent weather features in future? Katie’s rapid cyclogenesis prior to landfall over the UK was a precursor to the formation of stingjet winds. Stingjets are associated with vigorous bomb-depressions developed in a process called rapid cyclogenesis: in RaCy depressions central pressure falls very rapidly and slows the horizontal surface speed of the cyclone. A stingjet is a narrow band of gusty winds that descend from high altitude in the latter stages of RaCy depressions. They arrive from some 3-4km above the ground and are associated with descending stratospheric air into the low core. Ironically stingjets are associated with weakening fronts and aging cyclones. This descent of upper air pushes the jetstream lower and this can deliver extremely gusty conditions to the surface in a narrow band that is shown by a cloud hook and matching rainfall pattern. Watervapour satellite loop from 00hrs to 8am showing dry descending stratospheric air forming a dark slot – dry intrusion – that wraps into the developing low core: a sure signal of rapid intensification. The hooked rainfall signature below matched a marked increase in the strength of wind and the modest strongest gusts of the whole event of 52mph in Reigate. In exposed places like Redhill aerodrome this exceeded 60mph and over the North Downs at Kenley 68mph was recorded with 70mph in places. Arriving from high altitude, stingjet winds are unsurprisingly cold with low dew points. So you’d expect a dip in temperature at the surface. Parts of Wales and Shropshire had snow in this airstream wrapping round the back of the low as it moved into the North Sea. Stingjets match the mature stage of the Shapiro-Keyser cyclogenesis model. In all respects, they are aptly named as the “sting in the tale”. Storm Katie had some generally strong winds (for the SE of the UK!) associated with the southern edge of this cyclone where the tightest pressure gradients developed as pressure fell across the SE: in the narrow warm sector especially. The lowest central pressure was 971mb. Our Wight-Wash Oscillation reached 16 or 17mb at one stage: the difference between the pressure over the Isle of Wight and the Wash. Most significant storms to impact SE England have similar NE tracks through the Bristol Channel and exiting through the Wash. This was certainly the case with October 1987, St Jude 2013 and Storm Katie March 2016. A complex warm sector and bent-back wrapped occlusion make it tricky to identify the normal Norwegian model of warm-cold frontal passage. It is more likely that Katie, like other RaCY depressions, developed according to the Shapiro-Keyser model of rapid cyclogenesis which involves a break away cold front fracturing away from the depression core: T-bone. The wrapped rainfall radar and cloud hook above both suggest a stingjet feature associated with this kind of development. Now, onto evidence stingjets… the passage of the strongest gusts shown below do not match the passage of a “normal” cold front but suggest some other process was at work to deliver the strongest gusts. The strongest winds occurred 3 hours after the passage of the front that started to deliver the expected colder polar air behind the wrapped occlusion. This can be seen from the chart of Reigate wind speeds and temperature below. The chart shows the persistent warm sector gales proceeding from midnight on 28 March through to about 5am. These gales do not exceed 80kmh but they modestly peak just before the passage of the front, an expected pattern. 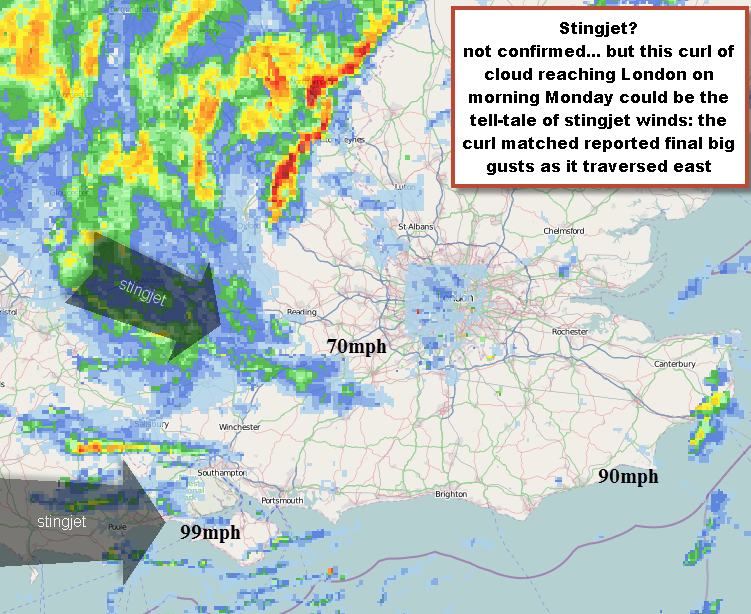 Fronts then pass through Reigate at about 5am and temperatures fall as expected, as do gusts. However, from 7am gust strength sharply increase, this matches the timing of the sting jet cloud feature on satellite photos. This increase in wind speed had no front associated with it and therefore suggests evidence of a stingjet process: arriving out of the blue! Note the temporary drop of temperature to a minimum and recovery after the departure of strongest winds. This again suggests these winds are not frontal in origin but are part of the stingjet process. Are they associated with a sting jet of descending high altitude air originating some 3-4km in the troposphere? I’d like to think this is a sting jet signature but will need confirmation from official sources to pin this down. For comparison shown above is a “normal” cold front passage from the previous weekend when a cold front squall line of some note passed through. Note there is no dip to minimum temperature associated with the maximum gusts and temperatures remain cold after the passage of the front because of the insurgence of cold polar air. This is more typical behaviour when it comes to frontal passage. Other charts and references support this idea, but some not unfortunately not quite with same timings. 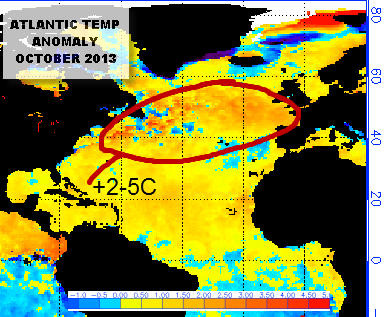 A warm Atlantic Ocean, some 3-5c warmer than 30-year average, acted as a perfect birthing pool and nursery for StJude. The warm sea surface temperatures provided plenty of extra water-vapour, heat energy and lift ready for stirring up a potentially big storm. 2. Add some extreme pressure! The North Atlantic Oscillation is a measure of the difference in pressure between Iceland and the Azores and it was in increasingly positive phase during the storm build-up. Whilst this is more of a measure than a cause, a positive phase nevertheless indicates LOWER than average pressure over Iceland and higher pressure over the Azores, which usually indicates a strong zonal west to east flowing jetstream across the Atlantic and fast moving weather with the potential for plenty of low pressure systems from the west. This rapid west-east flowing weather was a necessary ingredient in the set-up for St Jude. A very strong jetstream: blowing at 240mph across the Atlantic towards the UK acted as the main ingredient in the birth of storm St Jude. The jetstream directs weather on the ground. The jet over the Atlantic in the days leading up to St Jude was extremely strong and blowing directly across UK latitudes. The jetstream is a product of the temperature and pressure contrast between cool Polar air to the north and warm Tropical air to the south. The temperature difference between polar air and tropical air is particularly marked at this time of year: with the tropics still very warm, while the Polar ice sheets seeing a marked fall-off in temperatures with their attendant air masses. This builds steep pressure gradients and a strong jet. The jet is also a key factor in creating and guiding LOW and HIGH pressure systems on the surface. 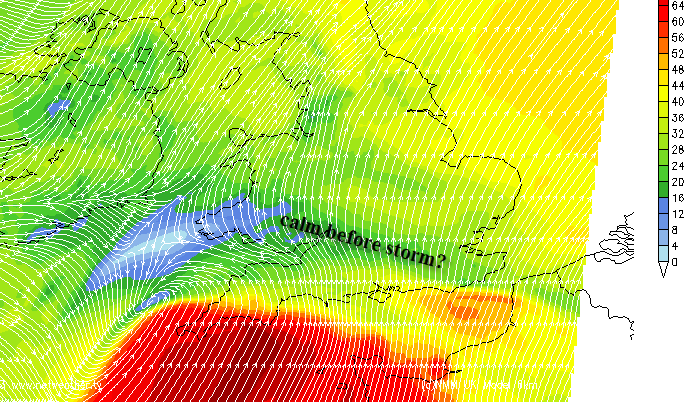 Like a dog on a lead, St Jude was dragged across the Atlantic by it’s angry owner, the jetstream. At times during the passage of the storm wind speeds above the Channel exceeded 180mph. 4. Whisk up some bad parents! So all the ingredients are ready, but no storm yet!? The mother of St Jude was a deep robust LOW south of Greenland. This formidable storm produced hurricane force polar winds directed from the NW in the days before St Jude was even a twinkle in her eye. The father was a weakening and slow moving tropical storm called Lorenzo. He had spent the week meandering slowly in the Mid-Atlantic but Lorenzo, despite his old age. still arrived with plenty of hot air from the Tropics. Their respective air masses collided in the mid-Atlantic some 1000 miles off the SW coast of the UK and, encouraged upwards by the jetstream, they produced their only child, St Jude! 5. Give it a stir! Cyclogensis is the process of rapid growth of a baby storm in the mid-latitudes: due to converging warm and tropical air and, encouraged by the jetstream, air rapidly lifted off the surface and Jude’s central pressure, as predicted by the UKMO fell steeply. This so-called meteorological BOMB exploded (or perhaps imploded, as air was dragged into the low pressure causing all that wind) formed a deep wave depression LOW that charged across S Wales and England in less than 12 hours. It made a rapid exit from the UK via the Wash and then continued to deepen across the North Sea before smashing into Scandinavia. 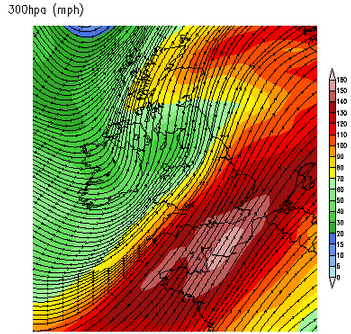 Arguably the storm did not deepen over the UK quite as spectacularly as some models forecast, but nevertheless, the track and winds were much as predicted and the storm went on to cause significant damage. 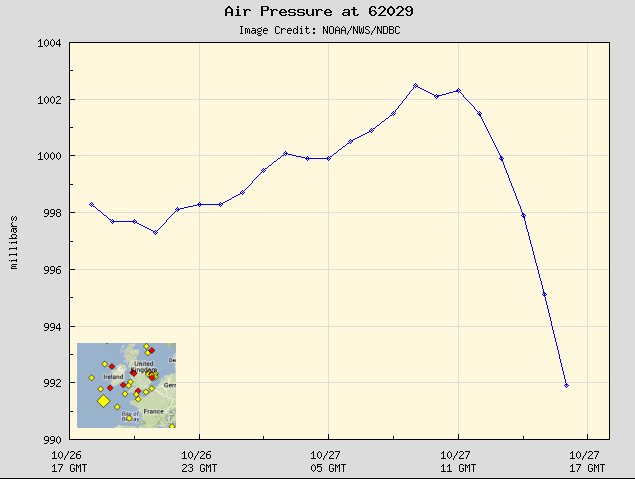 The chart below shows the pressure falling at a NOAA weather buoy in the development zone of St Jude some 300 miles SW of Cornwall. Note the INCREASE in pressure before the sudden drop-off. This is entirely in line with cyclogenesis: pressure builds ahead of rapidly developing warm fronts as isobars are buckled up ahead of the storm. This is popularly known as the “calm before the storm” where winds die down before the maelstrom hits. This was marked across the country on Sunday evening. At that stage people wondered “what storm?”. The satellite picture below of St Jude still in development phase shows the characteristic wave form kink of a rapidly developing storm. 6. Watch out for that sting in the tale! The storm was perfectly forecast by the UKMO up to a week before the event. It was always going to be hit-and-miss up to the last minute, not least with inevitable media-hype; but the consequences of playing this down would have been potentially disastrous. Overall, it was well predicted and people were warned effectively days beforehand. Whether they prepared effectively or took warnings seriously is another matter. 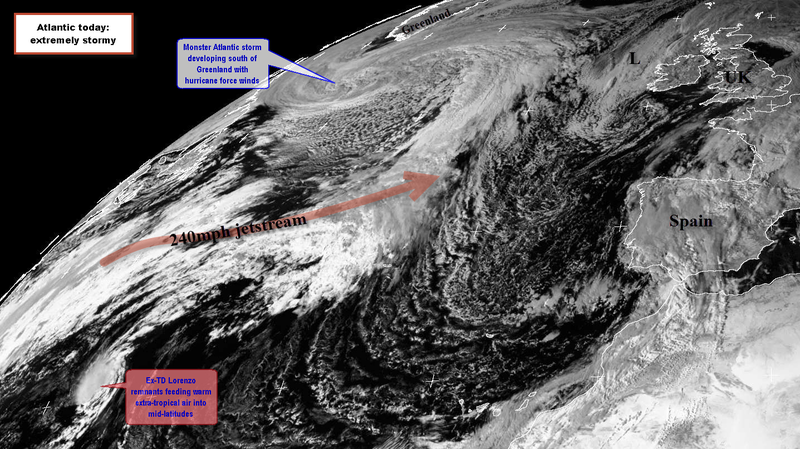 Below is a slide-show of synoptic charts showing the progress of the storm. Note that the central region of LOW pressure experienced light winds like a hurricane “eye” (but not as extreme in contrast!). Below this is a brief list of impacts. The highest winds were largely restricted to places south of the M4, excluding Wales which had 80mph+ winds in the run-up to the storm on Sunday but calmed down for a time overnight Monday as the centre of the LOW passed over the Severn Estuary and S Wales. Across S and SE England wind speeds were widely 40-60mph and 70-80mph+ on the south coast. Remember that average wind speed across an area can seem surprisingly low during a storm. The average wind speed across Reigate from 5-8am during the height of the storm was only 16mph! It is, of course, the random gusts that cause the most damage. The highest gust in Reigate was 48mph at 6:20am on Monday morning. 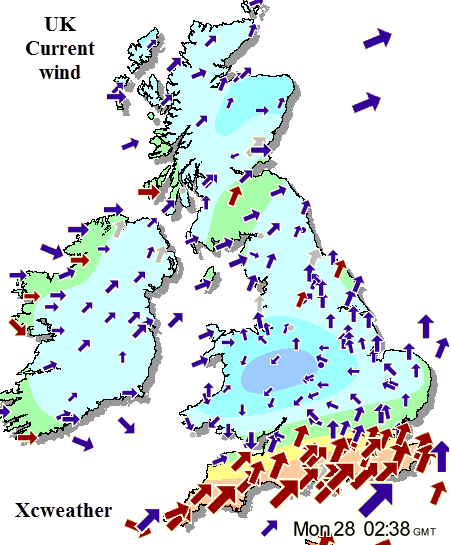 The highest official max gust was 99mph on the Needles, Isle of Wight, other notable wind speeds were Heathrow 70mph and 62mph at Redhill aerodrome. Reigate, as predicted by @RGSweather, was spared the worst as our max wind gust was 48mph. Our location in Surrey is away from the coast and locally the town is low down in a vale with low wooded hills to the south, Priory Park, that shelters the town from S or SW gales such as the ones StJude produced during the worst of the storm. More exposed parts of our local area certainly experienced higher wind speeds. Rainfall was intense for a period of time and caused localised flooding. In Reigate 25mm of rain fell overnight, which is more than for the whole month of July or, August, in less than 10 hours! St Jude crossed at night and only keen meteorologists were awake to see it go through. If this had been a daytime storm, impacts listed below are likely to have been worse with more people getting out and about, or attempting to. In the English Channel and approaches there were 20-30 foot waves and storm force winds. Major bridges were shut in high winds including Severn Bridge and QE2. Emergency service response was predictably very effective in dealing with thousands of calls. Public were advised not to call 999 for tree falls, and only call in real emergencies. Finally, the old chestnut “was it a hurricane?”… Despite getting winds exceeding hurricane force ((74mph+) UK storms cannot be classified as hurricanes. Hurricanes are tropical weather phenomenon and do not form in the Mid-Atlantic at our latitude, neither do they ever get to the UK. 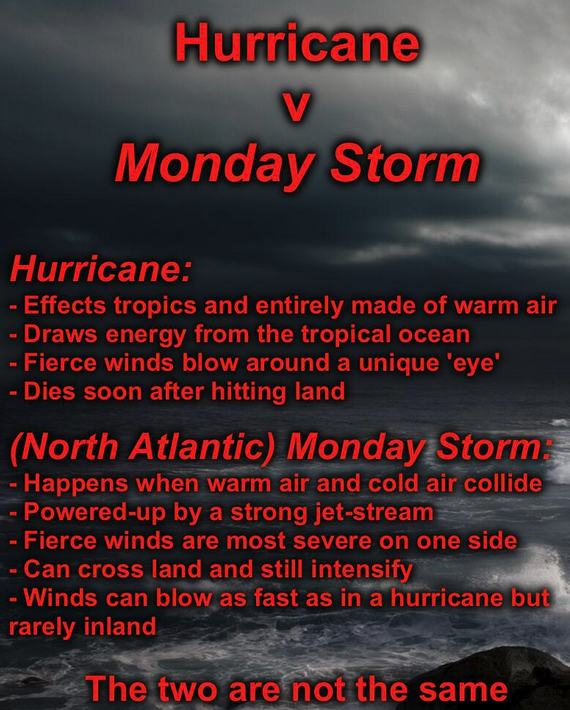 We may experience hurricane force winds in extreme low pressure systems which are confusingly also called cyclones, although they are NOT tropical cyclones! At our location, on this side of the Atlantic and this far north, we have never experienced a true-hurricane. Even the ’87 storm was not technically a hurricane despite having even stronger winds. We sometimes get “old” hurricanes impacting the UK but this is not the same, and neither St Jude nor 1987 were one of these characters. Handy pic below illustrates this nicely. Below this are a selection of photos posted on twitter mainly from our local area in E Surrey.